The Moose Country and the Wild Onion both receive a high volume of traffic daily. 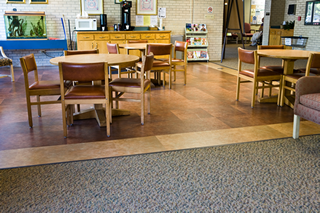 For this reason they needed durable carpet to hide wear and tear while retaining an attractive appearance. Each restaurant has a different and unique design theme. Owner Linda Schaefer required a more upscale design for the Wild Onion and a tough construction for the sports bar design of the Moose Country. Because both are open until 2 a.m., the work had to be done in the middle of the night so both could open for business at 10 a.m. 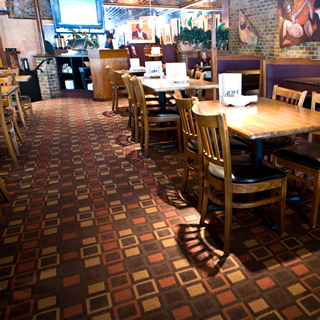 The Wild Onion – Design and Product Selection: For the Wild Onion, CBL suggested a geometric cut pile pattern to reinforce its upscale image and to add depth to the room. The bold colors also hid soil and spill, which was essential for the the restaurant. The Moose Country – Design and Product Selection: The Moose Country receives heavy concentrated traffic through the direct passage to its second level and patio. CBL suggested a dense level-loop product with a short profile to withstand the abusive foot traffic and proposed a multicolor piece that fit the Moose’s image. Installation: Because both locations needed after-hours installs and the removal and redeployment of both dining furniture and video game equipment, CBL started installations around 3 a.m. and finished in time for both locations to serve brunch the following morning.